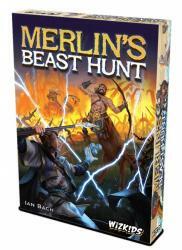 In August, WizKids will release the new dice game Merlin’s Beast Hunt. In Merlin’s Beast Hunt, the players are supernatural practitioners competing to capture the most valuable collection of magical creatures by trapping them between fences formed from natural elements. They use the custom dice for the resources to create the fences, which are represented in the game by semi-transparent cards. The player who can capture the most valuable beasts wins the game. Merlin’s Beast Hunt was designed by Ian Bach, and includes 80 custom dice, 18 beast standees with bases, 35 tokens, 64 semi-transparent cards, and 1 game board. The game is intended for 2 to 4 players, ages 14 and up, and takes about 45 minutes to play.